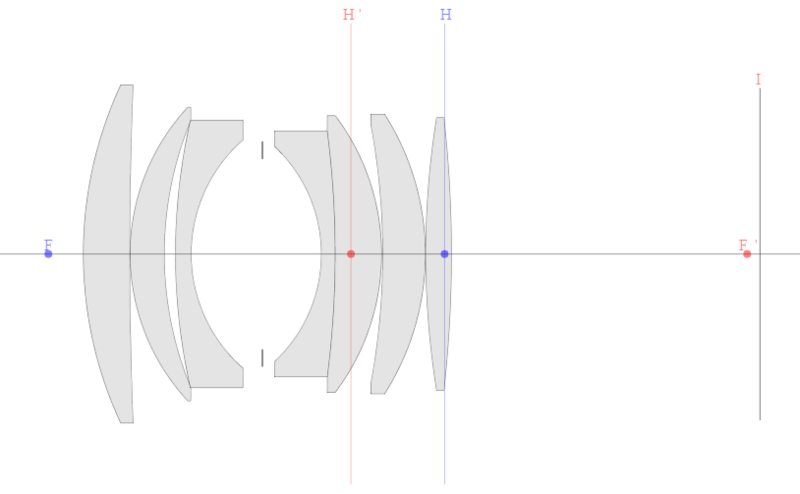 where S is subject distance from the object plane to the image plane, f is focal length, m is (positive) magnification, and i is the inter-nodal distance. Written in this form the term to the left of i is the distance in object space and the term to the right of i is the distance in image space. Remember, in our diagrams the object and image planes are marked with "O" and "I" respectively. Due to the slight paraxial variations the Optical Bench reports slightly different O to F and F' to I values for a total of 1643.04mm; quite close to the theoretical values. It's interesting to note the symmetry between 1 / m and m in the distance formula. S is the same at 0.5x magnification and 2x magnification! It's also clear than the minimum value of S is where magnification is 1. This form is a common approximation but it obscures the foundation that I outlined above.